Always open to a challenge it was some time ago now that a fellow slotcar racer and scratchbuilder asked me if I could motorise an old model he had had for some years. And, without giving it a second thought, I said yes. That yes started the longest ever period of model making I have done to date. Not because the model itself took a long time, but as time progressed, I came up against modelling tests which, if rushed or not thought out, might have resulted in a poor compromise of the model’s potential. The Model? 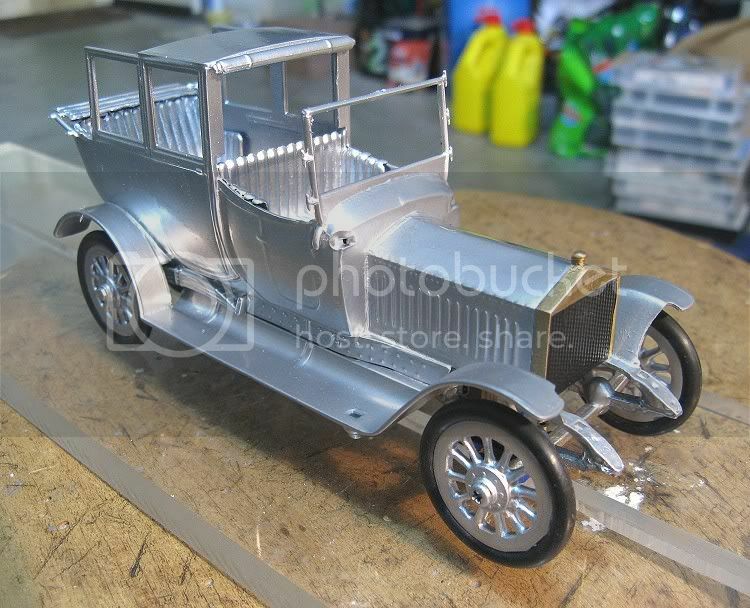 The Airfix 1911 Rolls Royce! So, without further ado, I put the model on my work bench along with several others, and on and off for three years, there it sat, progressing slowly, sometimes not being touched for weeks, uninspired for solutions and unmotivated to half do the job! So what was the problem? Well, first up I glued together the basic body parts to allow me to throw some solutions about. The body was also filled and sanded in preparation for some future day when the colour could go on. I procrastinated as to what type of chassis and running gear might go in the model. PCB? Brass? Plastic? I eventually settled for RHS brass tube. This would carry the rear axle motor and front axle. A chassis which slid between the model’s chassis rails was fabricated and motors were then up for evaluation. First motor choice was the little HO cube motor. A good runner which, although can rev high, was about the right torque range for the model. I didn’t want the finished product to disappear down the track like a scalded cat. There would be a great risk of the finer moulded parts becoming a statistic at the first or second bend. 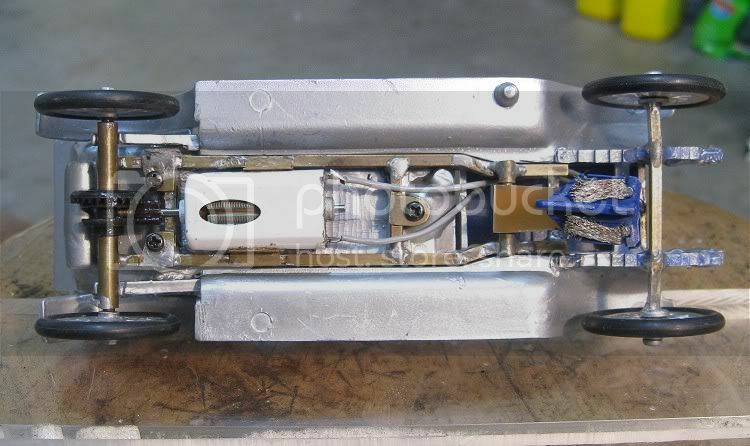 An HO motor was procured and was fixed on the brass rails underneath the models bonnet. I then pondered how to get the drive to the back wheels, possibly introducing a reduction set on the way, further gearing down the motor to allow the model to behave in a more realistic fashion. It was that tall that any attempt to round a bend at any sort of speed was going to be futile. While I was at it I settled on the rear axle set up and because of the space available, I went for a standard gear. With the aid of a good friend we mulled over possible gear set ups. Anything can be done on paper, but when it comes to reality, things sometimes don’t turn out as planned. Again after a period of inaction I decided to use another motor mounted directly between the chassis rails. This was one of the low output FF type motors which have proliferated in recent times. With about the same useful power as an NC1, the motor was probably about the best for the project, and, readily available. I was now resigned to using the FF motor with a standard rear axle reduction, and the motor power would be reduced with a five watt resistor, possibly of about 40 ohms or more. 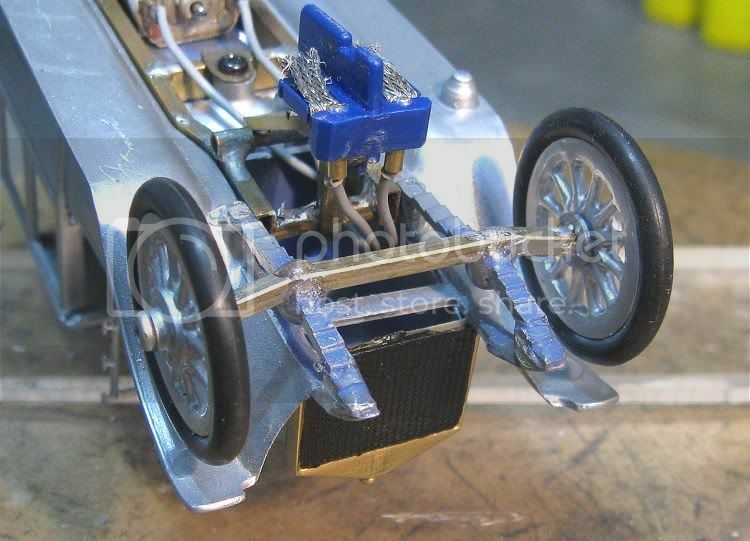 The front of the chassis was duly altered and the new motor choice fitted and the chassis was in its final form. Another problem to be overcome was what to use as wheels and tyres. It was gong to be a very lucky day to find ANY wheels and tyres that 1. looked convincingly like the original artillery wheels, and 2. Would actually function like wheels and tyres. At this stage things got a bit ambitious. 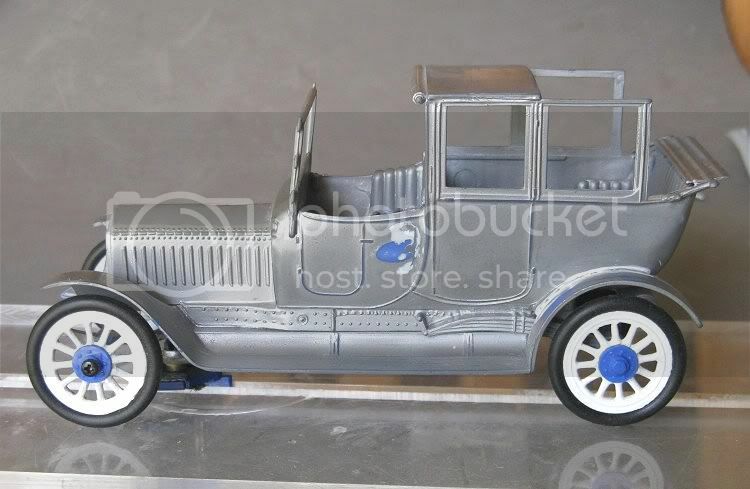 I discovered that the original plastic wheels could be turned down, eg. I could mount them on a mandrel and using a fixed drill as a lathe, I could turn the tyre part off the wheel. After removing this section I then turned and filed a concave edge on the wheel. This would hold the tyre after I decided exactly what I was going to use as a tyre. Again another period of inactivity ensued and things like tyres were pondered. While at work one day I was messing with an ancient high pressure cleaner and was taken with the ‘o’ rings that where fitted around some of the high pressure joints. A trip to the store and a dip in the ‘O’ ring box showed we had plenty of 22 x 4 ‘O’ rings!! Mmmmmm?! With the tyres sourced I decided to finish the other wheels, but disaster struck. The wheels were of a much poorer quality than the first one I had chanced to use. The centre hub of two broke away while turning them. I then put the model on the back of the bench……for some time! I eventually felt it might be time to look at the model again. I had been carving steering wheels for some of my other projects as I had run out of any usable ones from my spares box. It was a case of gluing three layers of thin plastic sheet together and marking out the steering wheel shape using a hole template. Drawing the spokes on and then with a very sharp modelling knife, carefully cutting and shaping the steering wheel spokes and profiling the steering wheel itself. Mmmmmm? Could I make Rolls wheels like this ? Mmmmmm? I had a sheet of three m.m. polystyrene ? I took the good wheel and copied it onto the sheet. The centre hole was drilled, the disc was mounted on the mandrill and four wheel blanks were turned up. I then drew around the spokes of the original wheel, and again, using a very sharp pointy knife, I slowly and painstakingly cut out every spoke to the best of my ability! Using the edge of the blade I then profiled each spoke individually! One wheel done! And a break…….of several weeks. Over an indeterminate time I carved the next three wheels. Always making sure I was in the mood for it. Disaster would set me back ages and disasters normally occur when you heart’s not in it. So, eventually the wheels were carved. Now to fit them to the axles. The rear was easy. The hub centre was sleeved with brass which fitted snugly over the rear axle shaft. The front wheels and axle also heralded a period of inactivity. I was originally going to adapt them to the original plastic axle but this was just not going to happen. The axle was too weak and there was no provision to allow me to reliably fix the wheels, so after yet another period of thought I decided to make a new front axle from square brass tube. This was shaped and the ends fitted with small bore brass tube which was threaded internally to take 2 gauge screws. The screws would pass through the wheel hubs and into the axle ends. The wheels were sleeved to prevent the screws gouging out the wheel material. 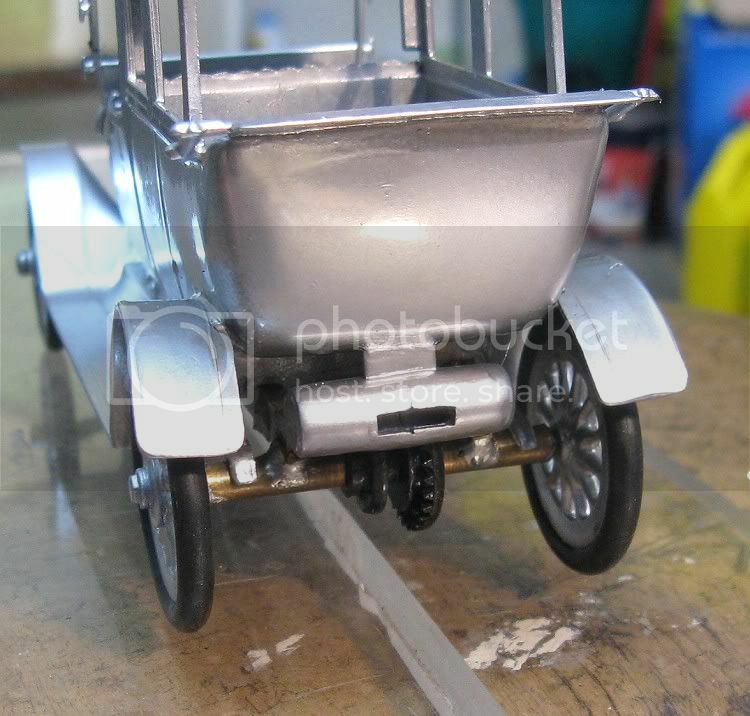 Eventually, with tyres fitted to wheels and wheels fitted to the front and rear axles the model’s height and level were adjusted. On the front wheels the hub caps had been glued on and the screws passed through the caps and into the stub axles. Almost finished, the model was going to need some sort of guide, and, not being a racing model, I decided on a drop down guide which sat a little behind the front axle. I didn’t want the guide sticking prominently out the front of the model. As it is now, it sits discretely behind the front axle and still functions well. Next up was a test run. The bare model was taken to the Red Team’s home track and the model ran a couple of laps at low voltage. The guide height was adjusted and finally I was happy with the over-all model. Last up was painting. 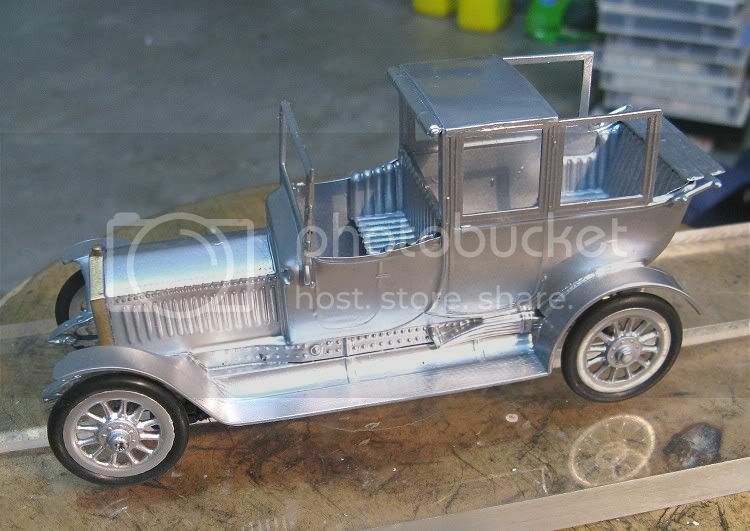 At this point and after possibly three years of on again, off again modelling I decided to let the owner of the model finish it in the colours of his choice, and at the time of writing this review I have handed back the model finished in silver with all the detail such as the lights and steering wheel and spare wheel to be added. I have to admit that there were times when I didn’t know if it was ever going to be finished, but perseverance and some lateral thinking got me through the difficult bits, and even though I say it myself, I think the wheels have made this model. Anything else would have detracted enormously from the appeal of the finished article; and, as with a lot of my models, it has been a learning curve which has pleased me immensely. Dare I say I look forward to my next challenge??? ?……………….Not THIS year!!! Owner, the Eggmeister, John Van Egmond has promised to send me some pictures of the finished body, as and when he finishes it, Mmmmmmmmm!.